Beyond Neptune sits one of the stranger dwarf planets, Haumea. This icy rock receives its flattened dinosaur egg shape from its lightning-fast rotation—a day only lasts four hours there. But it gets even weirder. New evidence is consistent with the presence of a ring. A tiny ring for a tiny planet. An international team of astronomers found Haumea’s ring by watching it from observatories across Europe as it crossed in front of the distant star, URAT1 533− 182543, on January 21st, 2017. Other astronomers weren’t necessarily surprised, but it adds even more complexity to Haumea’s already long story. It’s a controversial object, just not one that scientists know much about. “In contrast to other dwarf planets its size, shape, albedo [brightness] and density are not well constrained,” the authors write in the study published today in the journal Nature. The specifics to how Haumea dimmed the light of that distant star would be perfectly explained by a semi-transparent ring with a width of 70 kilometers (around 43 miles) and a radius of 2,287 kilometers (1,421 miles). They also measured the planet’s longest dimension at around 2,322 kilometers (1,443 miles), so around two Haumeas lined up lengthwise could fit inside the ring. Konstantin Batygin, CalTech planetary astrophysicist, wasn’t surprised. “This is an intriguing result,” he told Gizmodo. “But it fits in perfectly with our understanding of how this remarkable dwarf planet formed.” He explained that Haumea is spinning super quickly, probably as the result of some giant impact that happened billions of years ago. Such an impact created the dwarf planet’s two moons, Hiʻiaka and Namaka, and probably a cloud of debris, too. That debris would have coalesced into the ring. But Haumea’s recent story goes even deeper than that; its discovery a decade ago was rooted in controversy. As New Scientist details, astronomer Jose-Luis Ortiz’s team claimed the first discovery in 2005. But it appeared that someone at Ortiz’s institution had been sifting through famous planet hunter (and Batygin’s now-partner) Mike Brown’s online notes showing the object just before the announcement. Ultimately, the International Astronomical Union decided to give the dwarf planet the name coined by Mike Brown, Haumea, instead of the name given by Ortiz. Ortiz is the first author of the newest Nature study. As far as the context, there are other objects besides Haumea or the gas giants with rings, too. Scientists recently observed rings around the dwarf planets or “centaurs” Chariklo and Chiron between Saturn and Uranus. 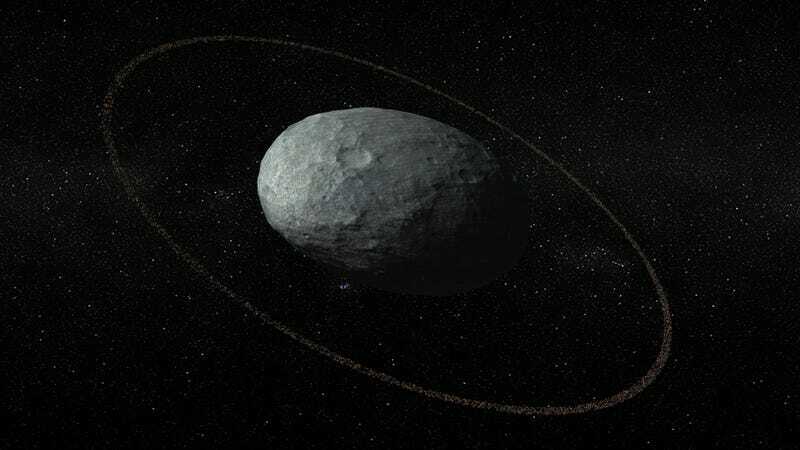 Haumea is a much larger object further out in the solar system, and together with the centaurs can help scientists learn more about planetary rings in general, writes Amanda A. Sickafoose, astronomer at MIT and the South African Astronomical Observatory, in a Nature commentary. There’s more work to be done in constraining all of the specifics of the ring. But just know that plenty of objects in our Solar System get much stranger when scientists look more closely.